La Ferme is situated in a private, gated complex in a beautiful area of the Charente with many possibilities to explore the local area or just relax in the sunshine and take advantage of the heated pool. The Charente region has the second most hours of sunshine in France after the med so you can be sure of long, hot days. For the children's amusement there is a play barn with table tennis, pool table, fishing rods and many games. The area ideal for keen anglers, canoeing and biking.The house is fantastically equipped for families, including wifi, video library, games and all the space you will need to cater for a party of 10. We have owned this property for 4 years now and spent may happy weeks with our family and friends, enjoying what the area has to offer. We spend many a day lazing around the pool, enjoying the local restaurants and days out with our children. We bought this house to come and relax with our friend and family and feel refreshed heading back to real life! Its a great space with enough room for all to have privacy or come together to enjoy the long hot days and nights! We have just moved to America for a short period of time and are saddened we will not be able to use our house as much. We have a fantastic couple who manage our property brilliantly, in our absence which sets our mind a rest knowing everything and everybody are taken care of. We love the history and peacefulness of the area. There is lots to do and see but you can really relax and go home refreshed, something we were looking for. First floor bathroom, a double sink with a bath with shower over. Separate WC on first floor Second floor has a WC sink and Shower unit. Fishing lake 5 minute drive. Swimming lake near Angueleme with water sports 30 minute drive, if that. All home from home facilities, oven, gas hob, microwave, large fridge, large fridge with freezer in utility, washing machine in utility, ipod dock, coffee maker, toaster, kettle, all crocker and cooking utensils to cater for a family of 10. Notes on accommodation: Maintaining many original features with all modern facilities needed to enjoy your holiday Outside: Shaded private garden to the side of the house with patio, table and chairs and BBQ. Table and chairs to seat 10, on patio at the front of the property to seat 10 under shaded umbrella. Swimming pool gated. Large garden to the side of the pool with seating, children's toys, gazebo with seating, BBQ with seating area. Utility Room: Fridge Freezer, Washing machine. Cleaning / Towels / Linen / Maid service: Bed linen provided Other: There is a second seating area on the top floor with sofa. 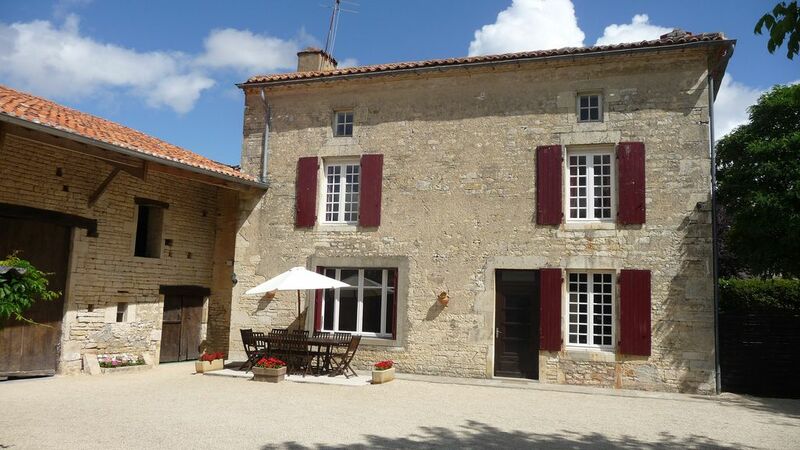 Perfect farmhouse property for a lovely French family holiday! We recently stayed in La Ferme with our two young kids plus another family and had an amazing stay! Not only is the property beautiful, it is fantastically equipped. It has a lovely heated swimming pool and an adjacent garden with space to play ball games. This is fantastic for those with young children as they can play there while you keep an eye on them from the comfort of your sun lounger by the pool. The pool alarm and gate adds reassurance. It has a play barn which has numerous games and toys, such as table tennis. And if you don't fancy leaving the house, there are plenty of DVDs and a Wii to keep you entertained on any (unlikely) rainy days! There's also a beautiful courtyard where you can enjoy a lovely BBQ and drinks and the house also has a number of things for those travelling with babies/toddlers, such as a high chair. The owner has also been excellent, and the house contains a folder with information on a number of things which you can do in the region, ranging from advice on where to eat, cycling routes to days out at a beautiful lake with a beach and animal parks. In summary, I couldn't recommend staying at this property any higher. Grannie, Grandad, Mum, Dad, Auntie and two teenagers and a mate all stayed in this wonderful house again this year. it has everything you need for a very relaxing holiday. Lots of room to be comfortable - although you are not indoors much with the gorgeous weather. The pool is heated so very pleasant and always plenty of loungers available (we were usually the only ones using the pool). Would definitely recommend staying here. Review. We are so glad you enjoyed your holiday here. We had the most fantastic holiday in this gorgeous house. Three generations in the family and everyone had a great time. The house was big enough to allow everyone space if they needed it although I must say we spent most of the time outside by the pool or around the dining table outside. The games room was great for the boys who love playing table tennis. There is also a lawn next to the pool where they played football (apologies to Dawn if they weren't supposed to!) and Frisbee. The pool was heated so was a real treat for the grandparents who in previous years with us have not been able to swim due to cold temperature. The pool is a communal, shared between the 5 houses but apart from a couple of afternoons, we were the only ones using it. The kitchen is really well equipped and since we ate in (I mean outside) most nights it was perfect. Lots of really nice places to visit in the area and just by chance when we were there over 100 classic cars drove into the village and parked up for us to look at - the boys were in heaven. We had a problem with the WiFi in the first day or so but the management company (Anne and Phil) were really helpful and arranged for an engineer to come and fix it. Anne was lovely and gave us tips on where to go and what to see and made us feel very welcome. The owners were also very helpful, answering queries promptly both before and during our holiday. At the beginning of the holiday we had some grumbles about the lack of TV channels (you can only use TV for watching DVDs/Wii) but we very quickly got over that as La Belle France in all its glory beckoned us outside. Would not hesitate to recommend this house to families wanting a relaxing home from home holiday in beautiful tranquil surroundings. Thank you for your feedback. We are so pleased you all had a great time. We have just returned from a really wonderful week in La Ferme. Our expectations were exceeded by the property, which we all adored, and which I would happily return to again. We were two families, with five children between us, and found that La Ferme was a perfect place for us to stay. The bedrooms are spacious and clean, and well-furnished, the living space was more than enough for 9 of us, and the combined delights of the glorious pool and the games room (plus Wii, board games, and more!) meant that we had more entertainment on hand than we had time to use. I was especially struck by how carefully and thoughtfully the house had been appointed. Large numbers of plates meant that we could load up the dishwasher after a meal, and still have enough to give the children snacks without constantly washing up after ourselves. Two carafes means that a large party can enjoy red wine together. A good selection of pans and kitchen utensils meant that cooking for a large group in the kitchen was easy to do, and never felt like 'making do' the way that rented properties sometimes do. All the children with us adored the various delights of the games room, which included such things as a pogo stick, a small plastic wendy house, stilts, as well as 'noodles' for the pool, table tennis and much more. I was especially impressed at the security of the pool, which meant that the adults could all relax even when the children were out of sight. The alarm and locked gate gave us all peace of mind. The pool was a big part of our decision to book, and we weren't disappointed - the children especially were in there for the majority of the holiday, and it was big enough for everyone to enjoy, deep enough for proper swimming, with enough shallows for our 5 and 6 year olds to enjoy improving their skills without being out of their depth. I also really appreciated the detailed information left in the house. Not just a pack of tatty leaflets, but really thoughtful and detailed recommendations for places to visit, with historical information, recommendations for parking,and other bits of information that we would have struggled to find anywhere else. The owners were accessible and helpful by email during booking, and when something minor needed attention during our stay they were back in touch immediately, and sorted it out swiftly. I recommend this property absolutely unreservedly, and hope this email is helpful if you're considering it. Thank you so much for your wonderful review. We do work really hard to ensure our clients have everything at hand. Your review is much appreciated. We are so glad you enjoyed your holiday. This is our second visit to ' Le Ferme ' a large renovated Farmouse at the centre of a pleasant enclosed farmyard in the middle of a typical quiet, attractive Charante village. The Farmouse has five bedrooms, all a decent size , clean, tastefully decorated, light and airy. A spacious first floor bathroom with powerful shower. The lounge/diner is large with sofas and other seating together with a TV and DVD and a comprehensive film library and video games for kids. Wifi which works throughout the house. A long dining table with room for every guest is at the back of the room. The kitchen has everything you need with an electric oven and gas hob. The house has an effective heating system if required earlier or later in the season and there is always plenty of hot water. Outside there are two seating areas with tables and chairs and a BBQ. Adjacent to the front door are two barns. The first contains a functional gym with weights, cycle and rowing machine. In the second is a childrens paradise of a snooker and table tennis, together with bikes, fishing rods and outdoor games, in fact all you need for an enjoyable holiday. A few yards away lies the heated swimming pool and adjoining grass and BBQ area. fenced off and alarmed to keep the kids safe. Any problems the property managers Phil & Ann are just a phone call away and when we needed them for a small problem, responded straight away. The property is very clean and well maintained. Booking is straightforward and Dawn is very helpful with local information. The property is in the village of Fouqueure with supermarkets 15 minutes away in Aigre and Mansle both with their own open markets. The large cities of Angouleme and Poitiers are 30 minutes & hour away respectively. The famous attractions of Puy du Fou and Futurscope are also easily reached. La Rochelle, Cognac and Rochefort are also nearby. If you just want to chill out the whole area is filled with quiet attractive villages and leisurely walks. I would thoroughly recommend this property and the area its located in, would love to return again. Thank you for your wonderful review. We appreciate your comments and as you know always try our hardest to make every guests holiday a pleasure. We hope you are able to enjoy our holiday home in the future. We travelled from Ireland for a 2 week holiday. The house was great for two families, well equiped, spacious.. Highly recommended. The Atlantic coast with its truly magnificent beaches is just over an hour drive away with La Rochelle perhaps being the most well known town. The nearest airports are at Poitiers and Limoges. Ryanair fly there from Stansted, East Midlands and Edinburgh plus other UK locations during the holiday season including Newcastle.FlyBe also fly into Limoges. Poitiers is about 55 mins drive to the Gite and Limoges 1.15hrs .The nearest seaport is St. Malo. It is about 4 hours away. Within 30 minutes of the property there are outdoor lakes with beaches, a great water park in Angouleme, the Vallee des Singes (Valley of the Apes) a great family day out. An hour away you are at Futuroscope. Booking Notes: We require a £250 Deposit to secure the booking. Final payment is 9 weeks before departure. A £250 breakages deposit will be taken with the final payment and refunded immediately after the house is checked by the Management company. Please refer to our booking terms for our refund policy. This will be sent with our booking form. Our cancellation policy does not follow Owners directs policy so please ensure you aware of this when you agree to book. Changeover Day: Saturday arrive at 4pm Saturday depart at 10am Notes on prices: Outside of the Peak summer season ie 11th July to the 5th of September we are happy to consider offers if you are wanting to rent the house and you are a smaller party. Please note our refund policy on all bookings will differ to owners Direct but we will make this totally transparent on our holiday terms at the time of booking.